I had some time one afternoon to use the RigExpert analyzer to tune the ol’ 6BTV. For tuning a trap vertical, I can’t imagine it being much easier. Between the analyzer and the DX Engineering tilt base, it only took about an hour. The procedure is simple. Hook the RigExpert to the antenna, scan the band you want to tune, tilt the antenna down, adjust the length of the space between traps, repeat. You do the highest frequencies first as that is the bottom of the antenna and will affect the lower frequencies higher up the antenna. This antenna is pretty broad banded in all the small bands, which isn’t really that hard to do. It does make tuning a matter of moving the small peak to a more desirable spot, in my case, the lower ends of the band where JT65 lives. The charts are kinda dull for 10, 15, 20, 30 and 40 meters. 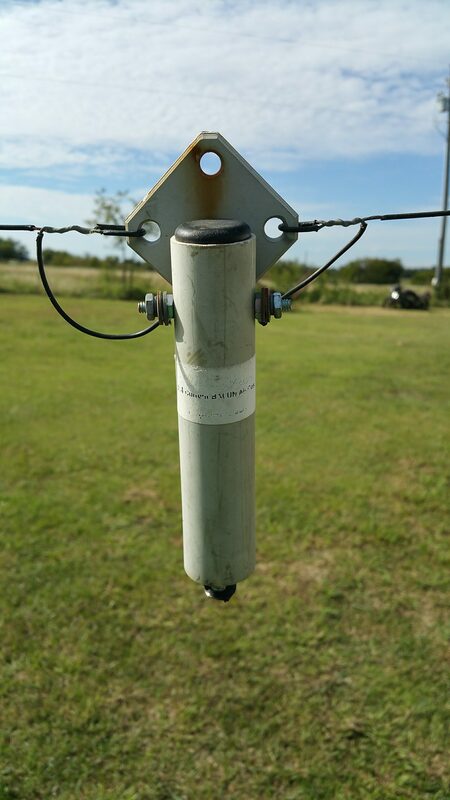 The nature of lower frequencies combined with an extra wide 80 meter band mean that its pretty hard to make an antenna that covers the entire band. This one is no different. Since the bandpass is so peaky, I chose to try for the middle of the band. 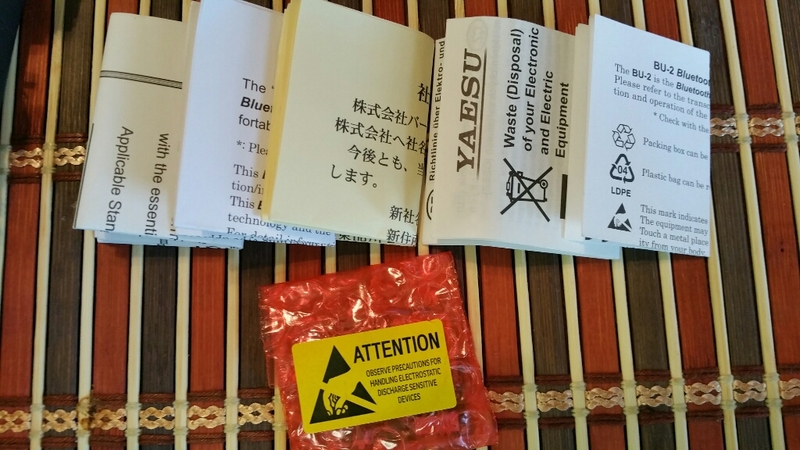 While I have not found a specific online source of the original instructions, I have found several essentially identical sources, so I will refer the reader to Google on the matter. Basically, cut a wire to the full length of a half wave dipole for the lowest frequency desired, in this case 40 meters so a bit short of 66 feet, plus a foot or so working and tuning room. Instead of cutting it in the center, cut it 14% off center, 42′ 2-1/4″ and 23′ 8-3/4″. You connect the legs to a 4:1 balun and voilà, OCF dipole. 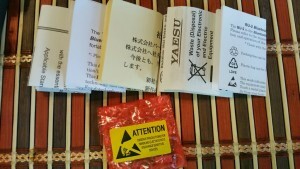 Here’s where the online information and what I was holding in my hand depart. As I write this, I have not carefully measured the legs of the antenna, but I strongly suspect that I may have cut the short leg not 14% from the center but 14% from the end. That leg of the antenna is significantly shorter than 23 feet and I really think it’s more likely about 9 feet, which would indeed be 14% from the end. Definitely a newbie sort of math error. Now it gets maybe kinda weirder. 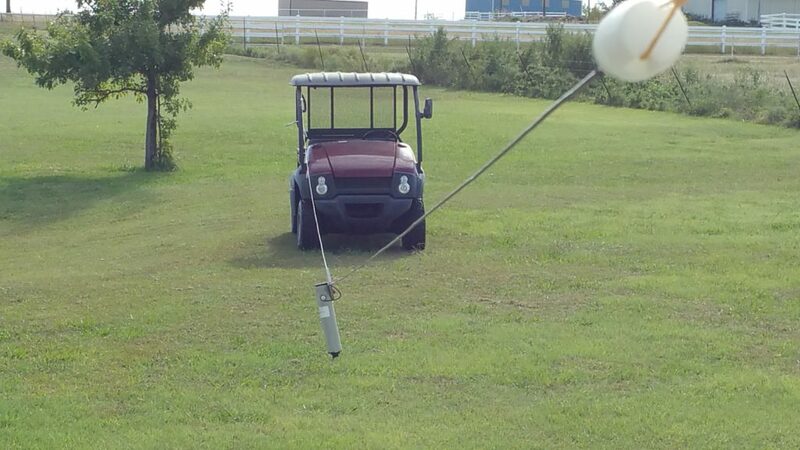 I strung that antenna up Saturday morning. Well, very temporarily “up”, with one end anchored to the workshop door frame and the other to the Mule. The short end is nearest the camera. 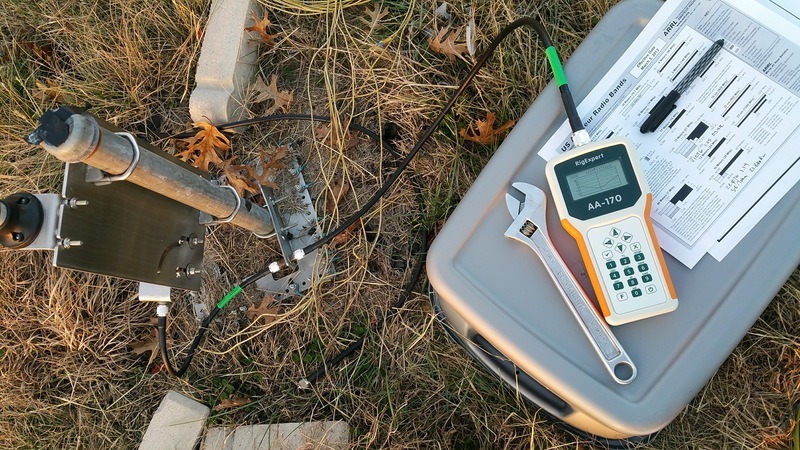 I connected the RigExpert to it with an 18″ jumper and did several SWR scans using it as a standalone unit. Turns out, the antenna appears to be tuned a little low, but it’s not so far off that it would be unusable, particularly with a tuner and on the low end of 20 meters, maybe even without a tuner. 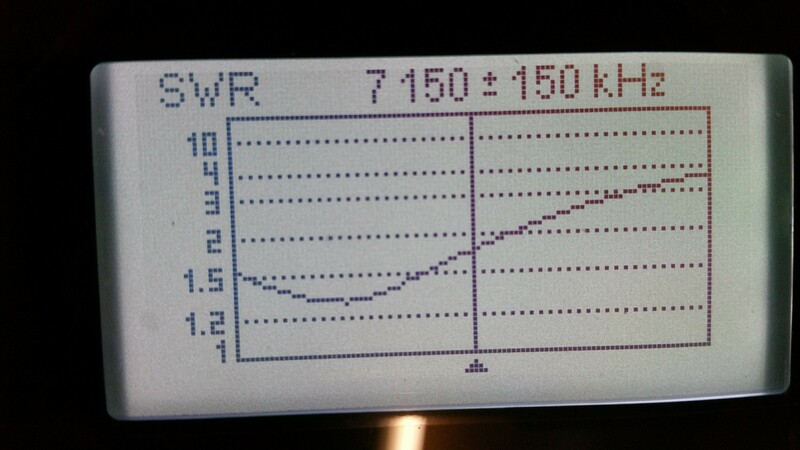 Those low SWR dips are just below 40, 20 and 15 meters. I think it’s funny that, at the time I was testing it on Saturday, I did not yet know about the 14%-from-the-wrong-end error I apparently made when I built the thing, so this didn’t seem to be off base at all. Scanning the whole range that the RigExpert can do reveals an even more surprising bit. The antenna appears to work at 2:1 or better from about 70MHz up. 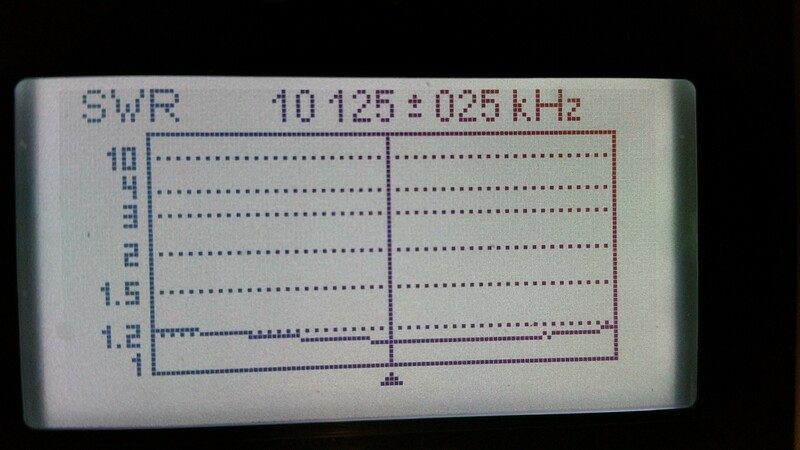 This scan is a little rough because there are only 100 points on a plot covering a full 170MHz. Armed with the information I now have about this antenna, I think I want to set it up and scan it at higher resolution and see if I can learn enough to understand why it works at all. 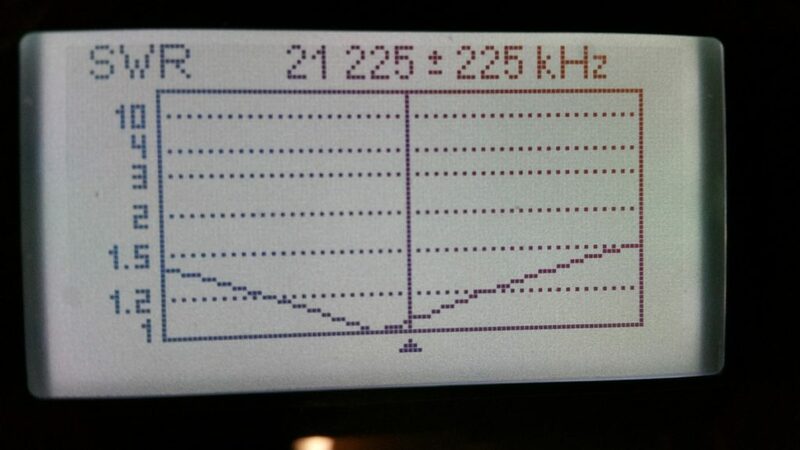 My intuition suggests that the high frequency response might be due to the one really short leg. I want to see exactly where that lowest SWR dip around 150MHz is and what relationship that has to the actual length of the short leg. I think the still reasonable response at lower frequencies may be related the antenna’s overall length and maybe harmonics of 7, 14 and 21 MHz. I do not yet fully understand the Smith chart, but this doesn’t look like one to learn on, at least not at 170MHz bandwidth. 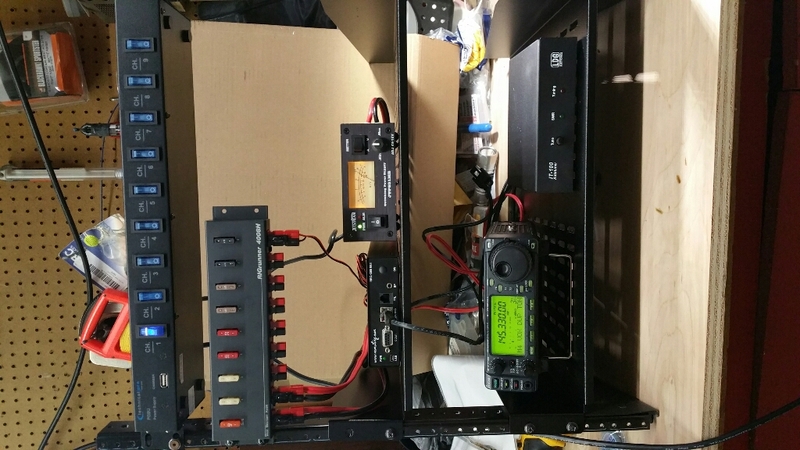 Unrelated to that, I also rearranged the equipment rack to accommodate a Mirage 160W VHF amplifier. The power supply I have for it is only 20 amperes, so it may not be up to the task. It is also missing the binding post nut. At first glance, I thought this was a 1/4″ x 28 tpi stud, but it turns out to be 6mm x 0.75 pitch. Once I have the power supply connected, I will try out the amp. 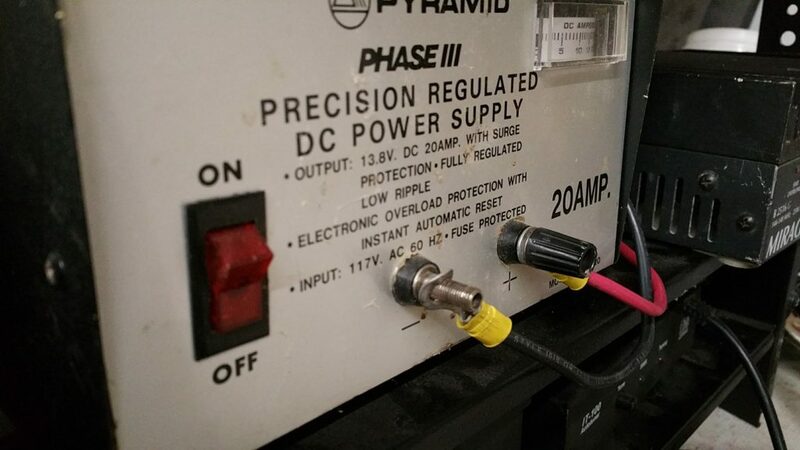 Interestingly enough, the thing pulls about 8 amps just sitting there. I am mildly suspicious. The ol’ 6BTV has been out there for three or four years and has served me well enough. It was about two years ago that I used an MFJ antenna analyzer to see where it’s peaks were after repairing it (from running it down with my truck) and they were all close enough to operating range to leave alone. However, my interest in more operating means that I’d like to have a better idea where it works best. 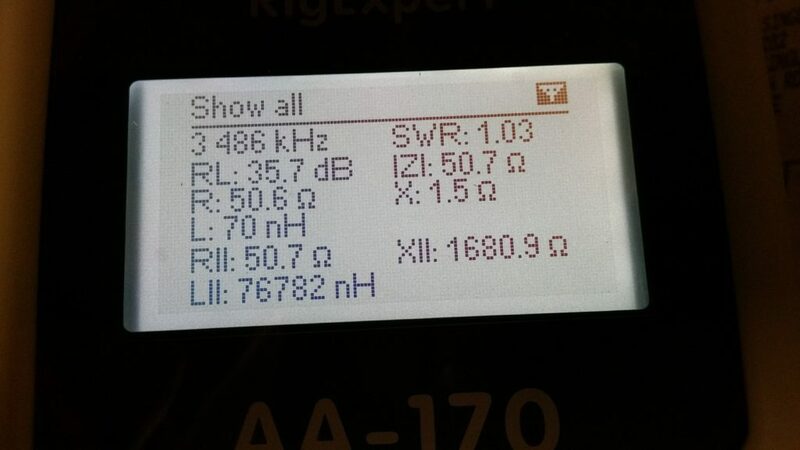 More than a year ago, I got a Rig Expert AA-170, the HF to 2m range device. Other than firing it up at my desk at work once, I’ve not used it until tonight. Pretty slick box. 10 meters is usable across the band, with a power-peak at the bottom end in the rtty/data sub-band. 15 and 20 meters are both pretty much smack in the middle of the band. 30 meters is a pretty narrow band, so it makes sense that it would be pretty flat across the whole thing. 40 meters is, again, a peak in the lower end of the band. With my interests in JT65 and PSK31, that’s probably as good a place for resonance as any. 80 meters is where I finally really need to tweak it. The resonance point is a few kHz below the bottom of the band and the antenna bandwidth is fairly narrow, so I need to choose a spot in the band and see how well I can match it. If I adjust 10 meters up a little in frequency, the rest of the peaks will move a bit upward as well, as 10 meters is the bottom section of the antenna. The software that comes with the Rig Expert does a decent job of graphing as well. 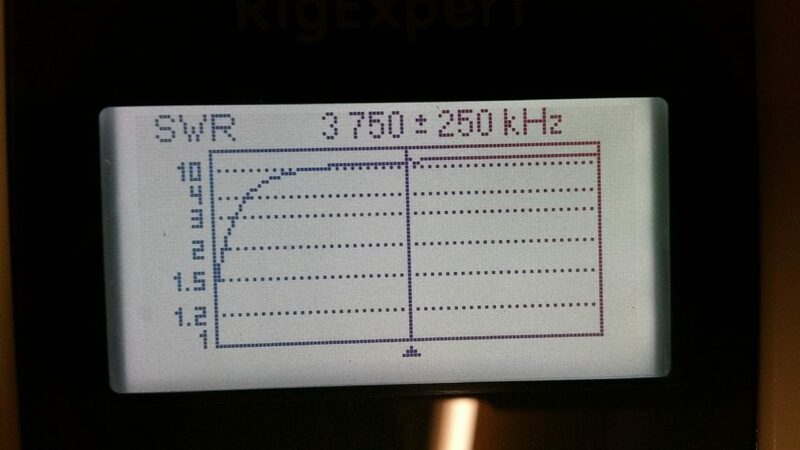 This is an SWR scan of 3.0MHz to 30MHz, accounting for 75 feet of RG213 cable. The dips obviously correspond to the tuning of the six bands that the antenna covers, 80, 40, 30, 20, 15 and 10 meters. The software also marks the ham bands in white on the background fill. Well, strictly speaking, I was not really off the air because I was receiving JT65 before I discovered the damage. We have a friend who visits once a year or sometimes every other year, and while he’s here, it does projects and other work around the house. This time, however, I had inadvertently set a trap. 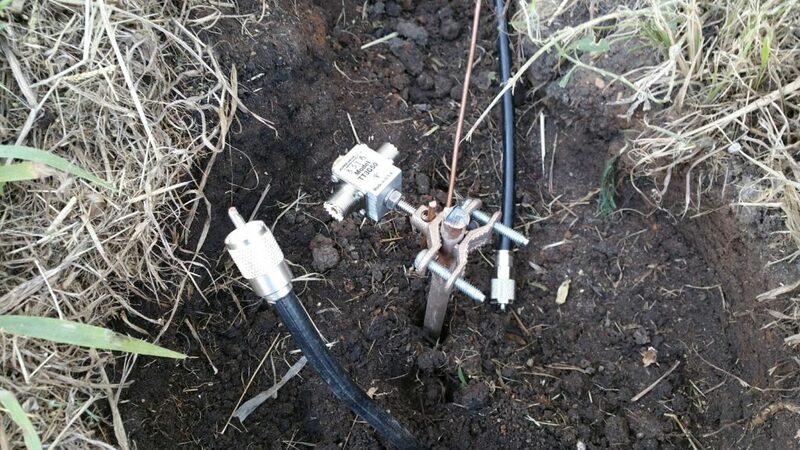 The coax from my HF vertical antenna comes out of a shallow trench too far away from the workshop. The Husqvarna walk behind line trimmer is a pretty powerful cutter. 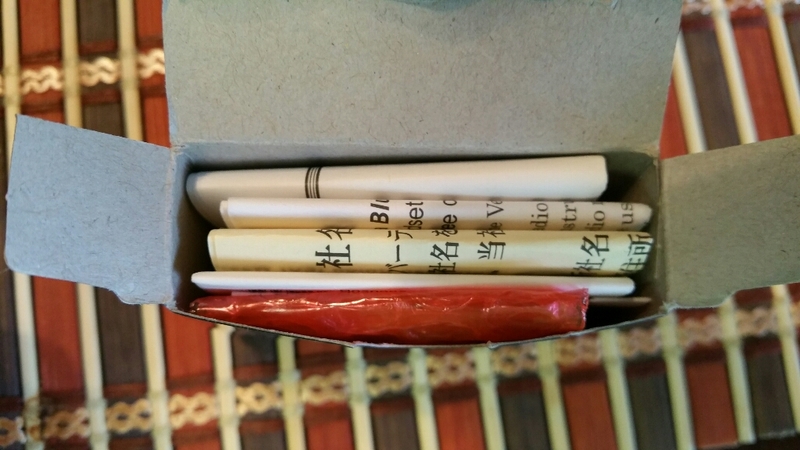 Yesterday, I finally had both time and the materials to repair the damage, protect if from future damage and to add lightning protection along the way. First, I put a new connector on the coax where it comes out of the dirt and moved my ground rod to the same area. 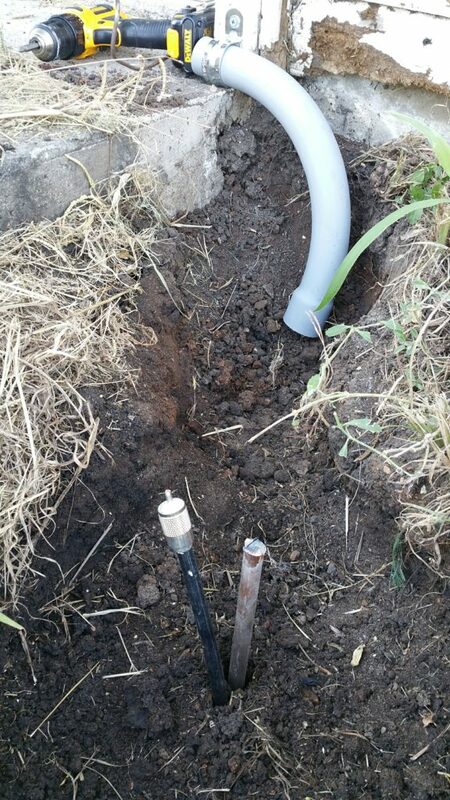 I also added 90 degree elbow of 1-1/2″ PVC conduit to protect the coax at the new spot where it comes out of the ground. 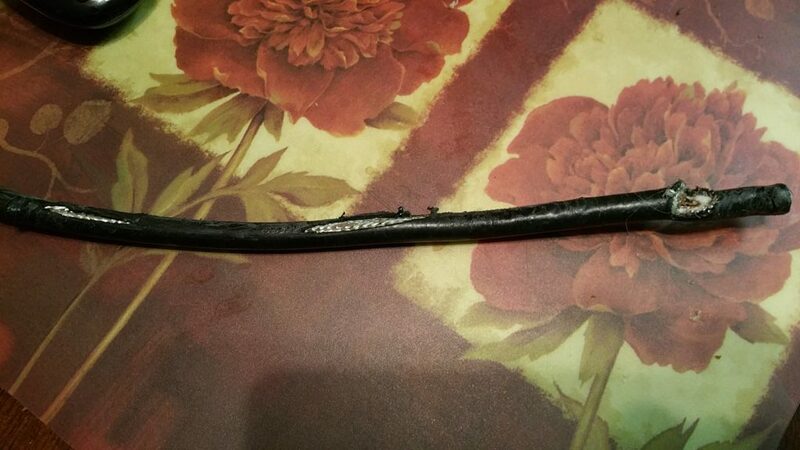 I hit something immovable with about 2 feet of ground rod still sticking out, so I cut it to length. The ground rod was closer to the radio before, so I had to replace the 10ga solid copper to the inside grounding block. 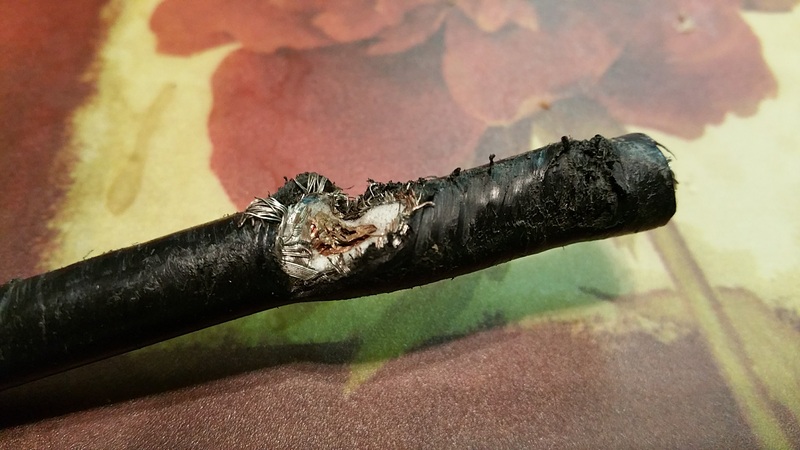 I put a new connector on the coax from the other side of the damage and fed them both through the conduit. I put an Alpha Delta stud mount surge protector on the ground rod, using the provided stud to clamp the station ground wire. I sealed the connectors with Temflex tape. 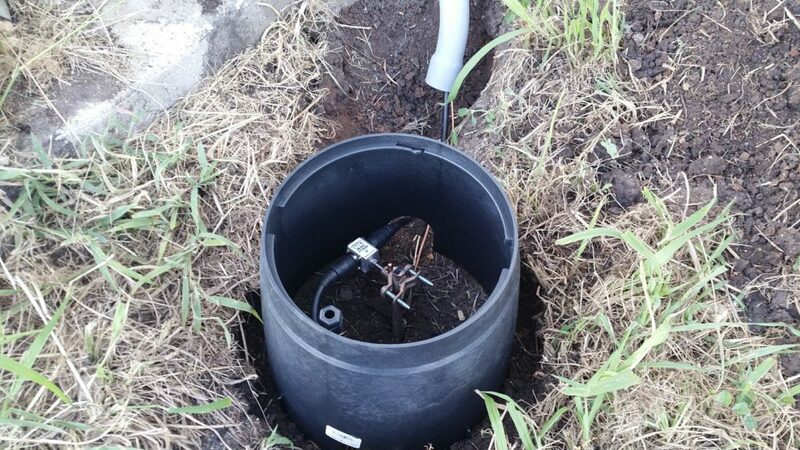 I dug out enough around the splice enough to put an irrigation valve box around it for maximum protection. Finally, I filled and packed the void with soil. Although I had a false start assuming the old intermittent transmit problem had returned, the antenna tuned up perfectly on 20m. Ok, maybe not that high…. Due largely to my difficulties in reaching in to repeaters in the DFW metroplex, I have been looking somewhat into erecting a tower. While my immediate plans are to put a Diamond X300 up on the top of it, having a structure for wire antennae or a tower mounted camera would be nice, too. The tower itself is expected to be $1500-2000, depending on installed height. Universal Tower has an aluminum self-supporting tower design that seems to hit all the bullet points. They use a system wherein they design a tower from 30 to 100 feet high, with wind load ratings of 3 to 35 square feet, using modular 10 foot sections of various sizes. They have straight, tapered and top sections in 11, 14, 18, 22, 26 and 30 inch widths. The heavier ratings are shorter towers with wider sections. The straight sections are, duh, a straight section of that width. The tapered section are of that width, but they taper down to the next smaller size at the top. The top sections are finished off like you expect a top section to be, with a conical bit and a place to put a pipe or tubing mast. I have analyzed the sizes and chosen a starting point of the 9-40 tower, 9 square feet rating, 40 feet high. The entire system consists of a big block of concrete (4 x 4 x 4 feet, which would weigh just short of 5 tons) in the ground with a 22 inch base unit, a 22″ tapered section, an 18″ tapered section, a 14″ tapered section and an 11″ top section. 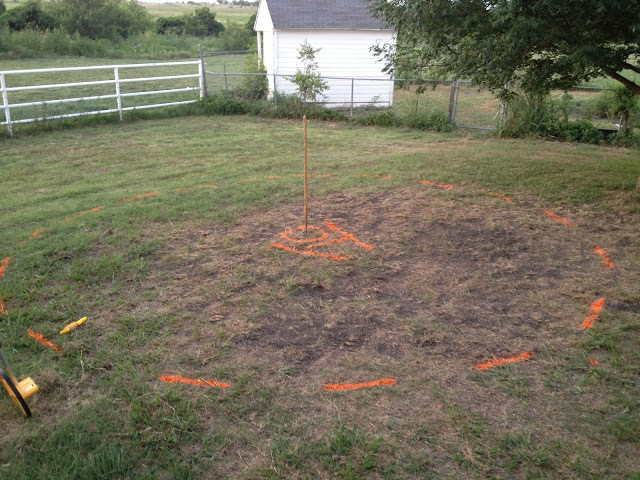 The tower itself is about $1115, not counting the concrete and digging the hole for the anchor. If 40 feet is not enough, I can add an 18″ straight section between the 22″ tapered and the 18″ tapered for $270, raising the assembly to 50 feet. Continuing, I can add a 14″ straight section for $155 to make the 50 into a 60 and a 22″ straight section for $409 to make the 60 into a 70. As the height goes up, the wind load rating goes down, 9 square feet, to 7, to 4 and to 3. The 70 foot design is the tallest they allow for the 22″ base. The next size base, 26″, requires a bigger concrete base (4.5 x 4.5 x 5.0 feet) and the 40 foot tower, while rated for 23 square feet wind load, starts just a little cheaper than 22″ 70 foot. Furthermore, the 70 foot tower with the 26″ base only gets 1 more square foot of wind load rating. I’m guessing a 50 foot tower is likely what I will need to get a better signal into the metroplex. 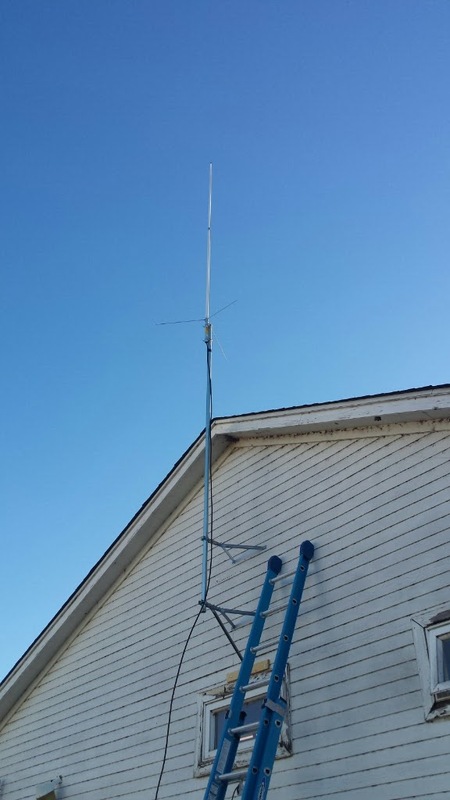 The antenna itself is 10 feet tall and could be mounted on a 10 foot mast at the top of the tower, so the base of the antenna would be at about 58 feet and the top at about 68 feet. I have a couple of emails out to get quotes on the concrete and the digging. I suspect that digging in our area will hit rock only a little way down, so mechanization is probably going to be a requirement. There is another variable that I thought wise to check on. The runway at a nearby grass strip airport points pretty much directly at our house. On the fcc.gov website, there is an online tool called TOWAIR wherein you can plug in your coordinates and some details about your proposed tower and it gives a PASS/FAIL on whether your structure needs to be registered with the FAA. It basically calculates the maximum height that a structure can be, based on some rules and specifications. Because this little airport has a runway in excess of 3200 feet and is designated for Public use, a structure within 20,000 feet must fit in a 100:1 glide slope. For every 100 feet farther away, the structure can be 1 foot taller. Short version, 70 feet is 36.09 feet too high. Now I am almost certain this does not mean that the tower would be prohibited, only that it must be registered. Further, it may need to be painted or lighted. I have much research to conduct. By easter-egging various figures, I was able to determine that a height of 32 feet 9 inches would not need registration. Also, although it would be fairly impractical, moving the tower to the farthest point away from the airport and still on our property is not far enough away to change the permitted height. While I was snooping around with antenna heights and locations, I punched in the numbers for an 80′ tower on a property not too far away. It is far enough away to clear the requirements with 9.8 feet to spare. The good king Harald came bearing gifts. 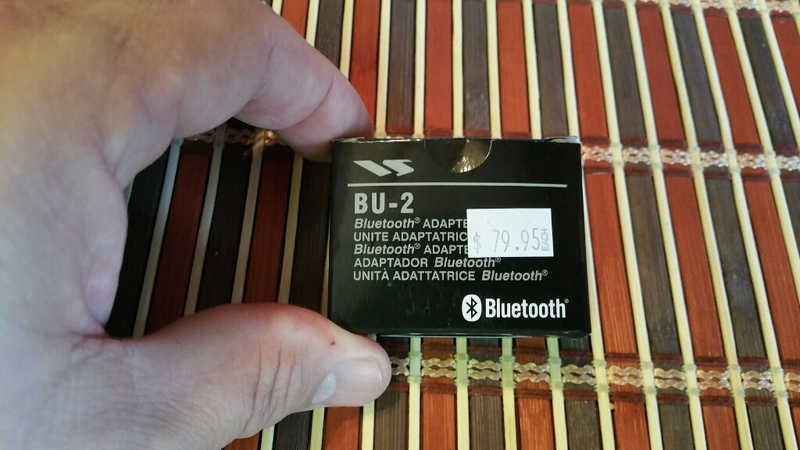 The Yaesu BU-2 is a Bluetooth adapter for, amongst others, the FTM100DR. Other than the 10 screws required to get into the radio, it was very simple to install. First, you need to get it out of the box. 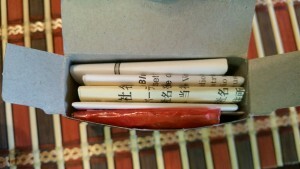 A tiny box. The box is full, just not with much electronics. The card itself is a little bigger than a quarter. 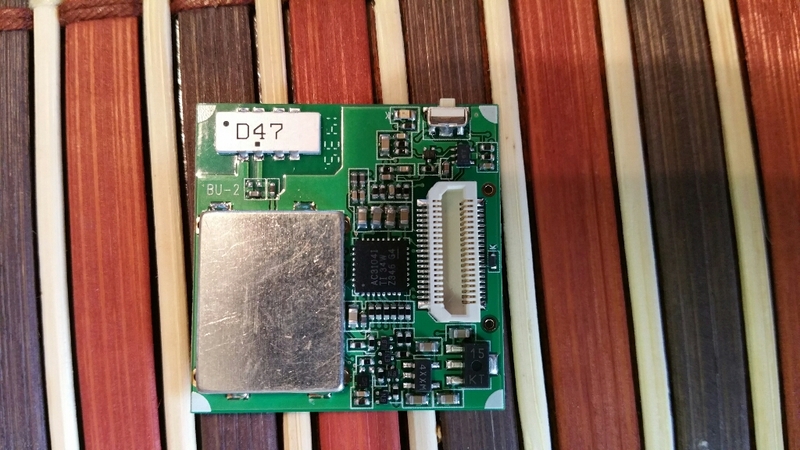 Curiously, there is a tiny pushbutton on one edge of the card, but it’s not reachable without pulling the front over off and it is not mentioned in the directions. Shrug. The inside of the radio is nice and clean. The card plugs in near the front of the radio, where the plastic front wouldn’t shield the signal. Once installed, the settings (split into two menus for some reason) suddenly work. Defaults seem to work fairly well. I paired it with my LG HBS-750 headset. I have others, but that one was handy. It paired quickly and easily. Operationally, the “answer” button on the headset serves to toggle transmit. Press to talk, press again to stop. Interestingly, the current menu option was “Momentary”. The other option, “Toggle”, made the transceiver stick in transmit. I suspect it’s just a difference of opinion between the radio and the headset. I will continue playing with it. 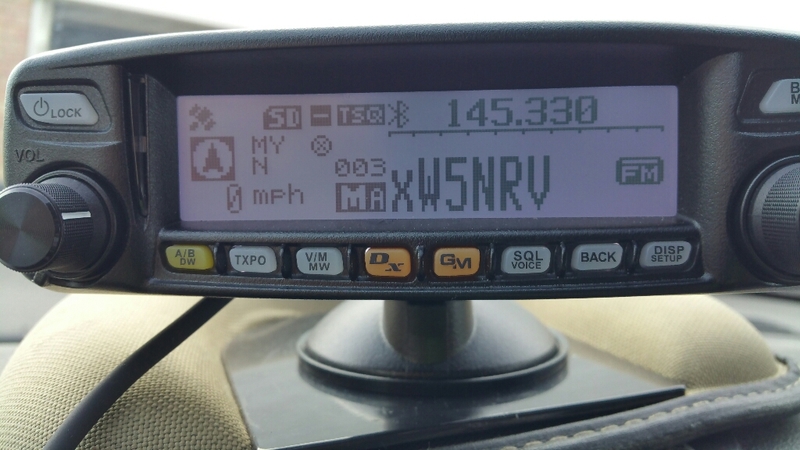 I had never really thought much about APRS. It seemed like the only application getting much attention was vehicle tracking and I think our privacy is compromised enough already. However, I came across this propagation map website, which is populated using APRS data. It can be argued that it’s not very scientific, basically building a propagation map based on the location and signal strength of received APRS packets but I don’t think it’s completely without merit. 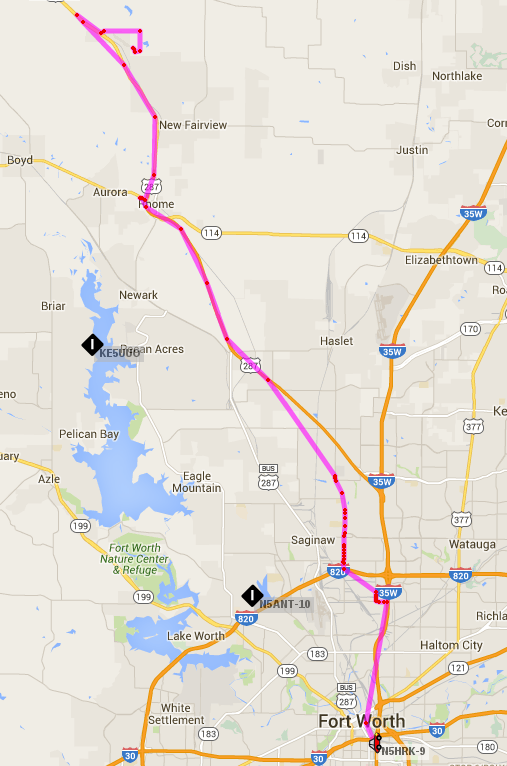 In any case, my interest in how this works lead me to experimenting with the APRS settings in my FTM100DR. 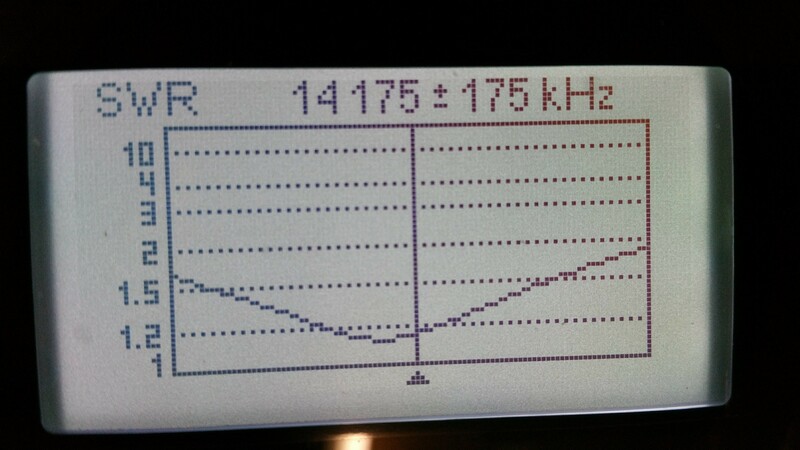 Just getting it receiving data is trivial, basically enable the modem and set the frequency to 144.390 simplex. There’s not much more to getting it transmitting beacon messages. After a brief trial last night, I set it up to send every 3 minutes this morning and tracked my commute. As luck would have it, I-35W was shut down for a while and I had to take an alternate route. Also, at one point, I turned it off as I got into solid range for Fort Worth repeaters, but once I was on said alternate route, I put it back on APRS for the fun of it. Between that, the 3 minute update interval and I presume an occasional lost packet, it looks like I went offroad or maybe airborne occasionally. As I researched APRS, I found a lot of references to it not being just a vehicle tracking facility. In fact, a number of people seem to think it the acronym is Automatic Position Reporting System, rather than Automatic Packet Reporting System. Granted, GPS equipped mobile transceivers make mobile location data easy to share, but that is not all it’s good for, i.e. the afore mentioned propagation map. There is a plethora of information at www.aprs.org, a pretty good starting point. As for my own homework, the quickie setup I have on my FTM100DR now means it is either doing APRS or voice. In fact, I have to remember to turn off the beacon when I go back to voice, lest I hit voice repeaters with APRS packets. I can’t imagine that’s the only way to set it up. Longer term, I can see it being fun to set up a permanent beacon. Just need a compatible transceiver and a TNC/PC combo. I see another Raspberry Pi project in my future. 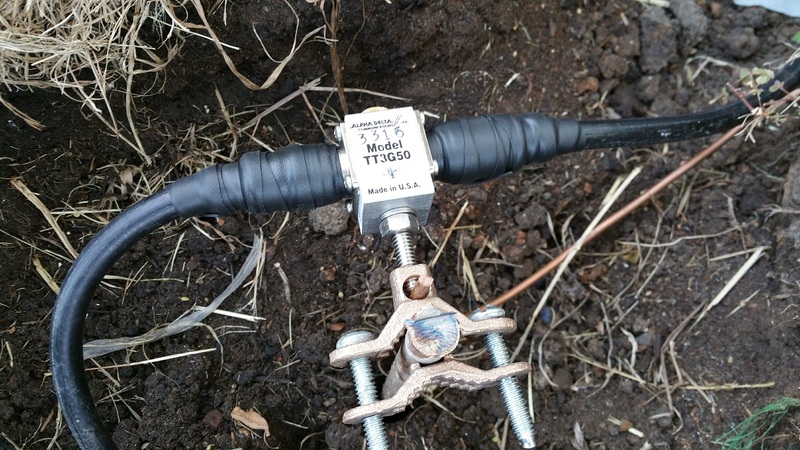 There are a couple of free elevation tools on the internet. I don’t like the conclusions, but I guess it’s better to know. FreeMapTools has an Elevation Finder tool. With it, one can easily check specific elevations anywhere you click on the map. There is also that less intuitive but better suited Hey What’s That website. I did profiles of my path to repeater with both Elevation Finder and HeyWhatsThat. They seem to agree that my 885-ish foot home elevation is no match for the 1000+ peaks between me and the 949 foot repeater antenna. Note that the highest elevations are within 3 to 5 miles of home. The only good news is the orange highlighted area, particularly the skyward piece. 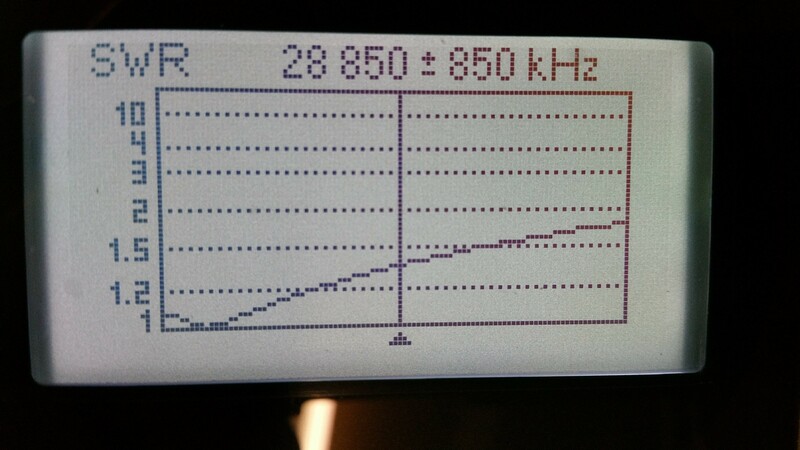 This is the calculated propagation of a 145MHz signal between these two points. The fact that I can hear the repeater fairly well is also promising. At this point, more gain may not make nearly as much difference as more altitude. The calculated altitude needed for a completely unobscured point to point view would be 170 feet above ground on my end, so lets hope it doesn’t take that much. 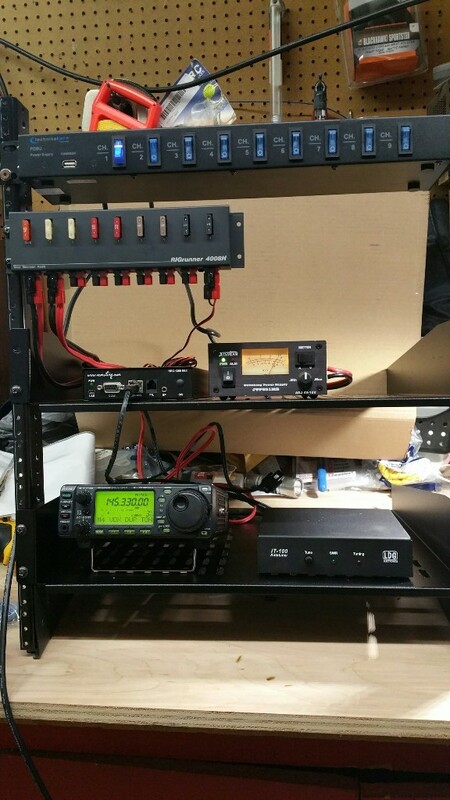 I finally put together a desktop 19″ rack that I have wanted to put together to put all the RemoteRig Radio end equipment into. It went pretty quickly. The shelves came with hardware that didn’t fit the threaded holes in the rack. Luckily, I did have enough of the right size to assemble everything, though I need a few more to make all components attached with the right number of screws. At the top is an AC plug strip with individually switched outlets. At some point, I hope to have some other equipment in this rack, so the lone device connected to it on switch 1 will have buddies. 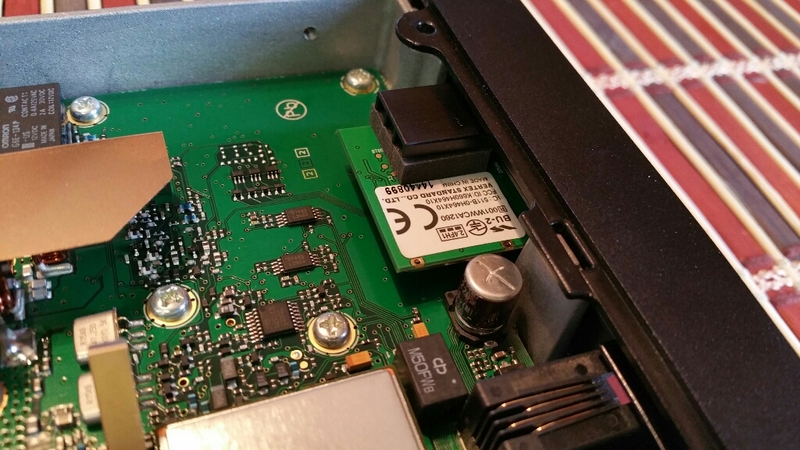 Switch 1 powers the JetStream 25A switching power supply. The DC output connects to the input of the RIGrunner 4008H distribution panel. 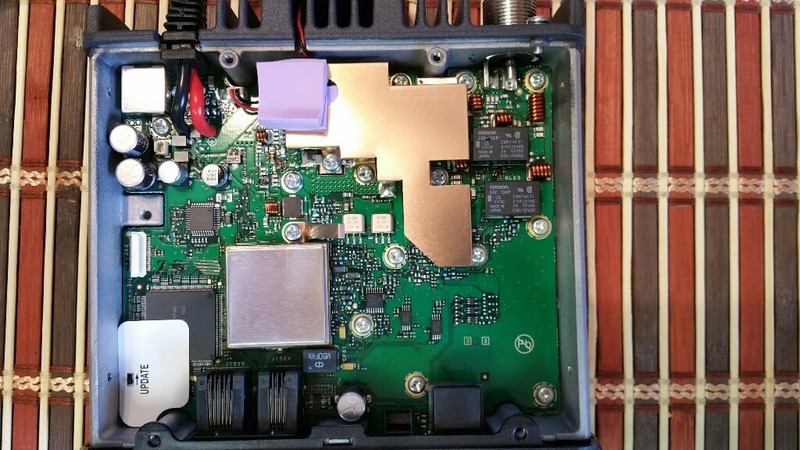 I connected one of the 25A outputs to the Icom and one of the 1A outputs to the RemoteRig. I made up a spare power cord to use with either the Kenwood TM-731 or the Yaesu FTM100DR, as they both use the same T-style connector. After that, it was just connecting the grounds and antennas back to it. For the time being, I have left it in the center of the workbench because it’s permanent home still needs a bit of work to clear out. We’ll see what the evening allows. I have had some trouble getting a signal all the way back to Fort Worth. In fact the repeater I frequent is pretty much exactly 28 miles away. 50 watts into a 6.5 dBi omni antenna *should* look like 136 watts, but that doesn’t account for the hillside between here and there. Our property is downhill from the street, but today I used a builder’s level to quantify what I believe to be a significant factor in my limited range towards Fort Worth. 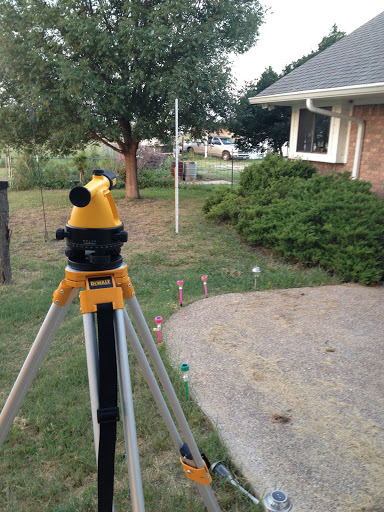 For those unfamiliar with a builder’s level, it’s a piece of surveying equipment used most often to ensure structures are level over long distances, particular stuff like driveways or drainage ditches or houses. 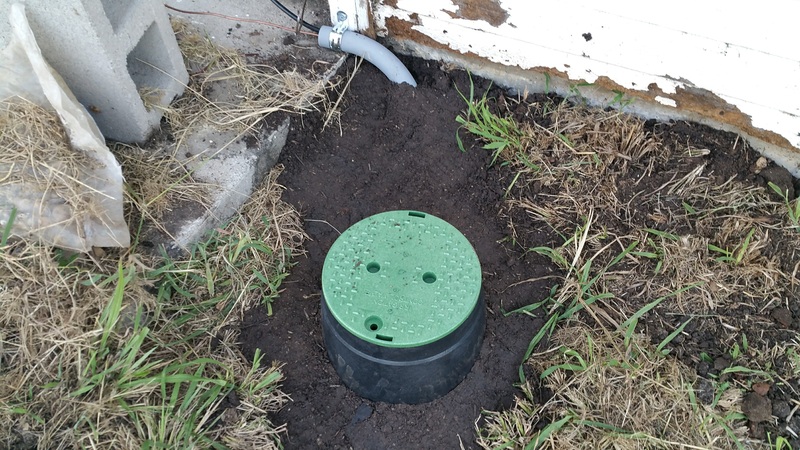 I first used one when we were building a sand pad for an above ground pool. The ground within this circle is 10 inches lower on the left side than the right. You set up the level on it’s tripod and either leave it where you put it throughout the project or mark precisely where the legs are. 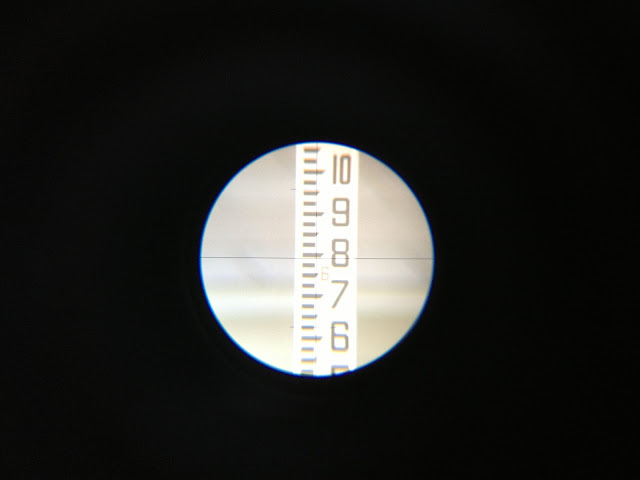 Using the bubble level on the device and the adjuster wheels, you set the unit itself level, then using the graduated measuring stick, you look through the little telescope and get the height of the measured point relative to the level plane described by the tool. This pic shows the view through the view scope. The ‘6’ is very dim, but in this view, the ground at the measured point is just under 6′ 8″ below the crosshairs in the level. Well, I did not use the measuring stick because I was looking for much more of a thumbnail measurement (and it’s a pain to do without an assistant), but I set the level up on the street out front and took a sighting off the antenna on the workshop. The level is 5 feet up from the street. Once set, the level sighted the workshop just a few inches below the roof peak. Go down 5 feet from there and it’s about the bottom of the antenna mast. So… the antenna mast is essentially sitting at street level, meaning the base of antenna itself is only about 9 feet above the ground in the direction of the repeater. Even with a beam, I will probably need to get some more height.